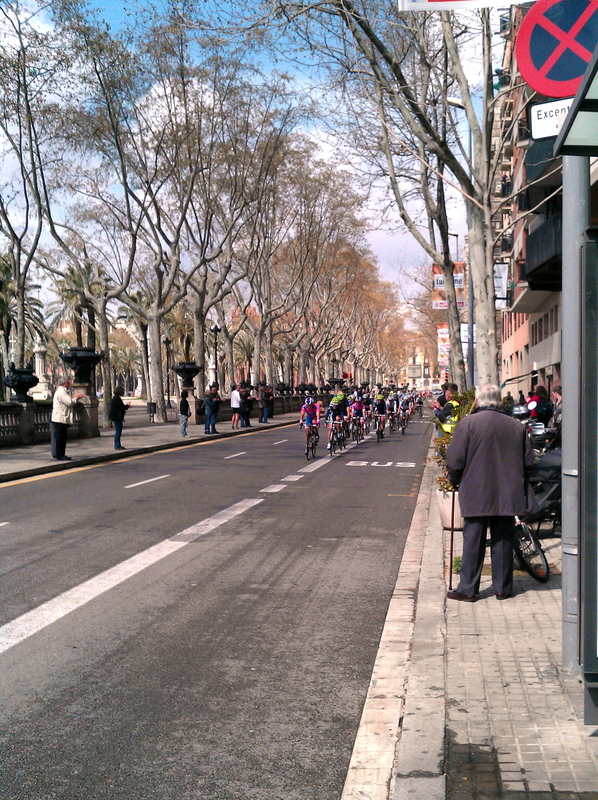 The final stage of Volta Catalunya was in Barcelona, so I decided to head down and try to watch it. I was a little nervous to try out the train and subway systems for the first time, but it turns out it’s pretty simple and a friend helped me figure out directions beforehand. I came out of the subway near the coast, and headed toward the course. Barcelona is beautiful! I can’t wait to go back to do some real sightseeing. 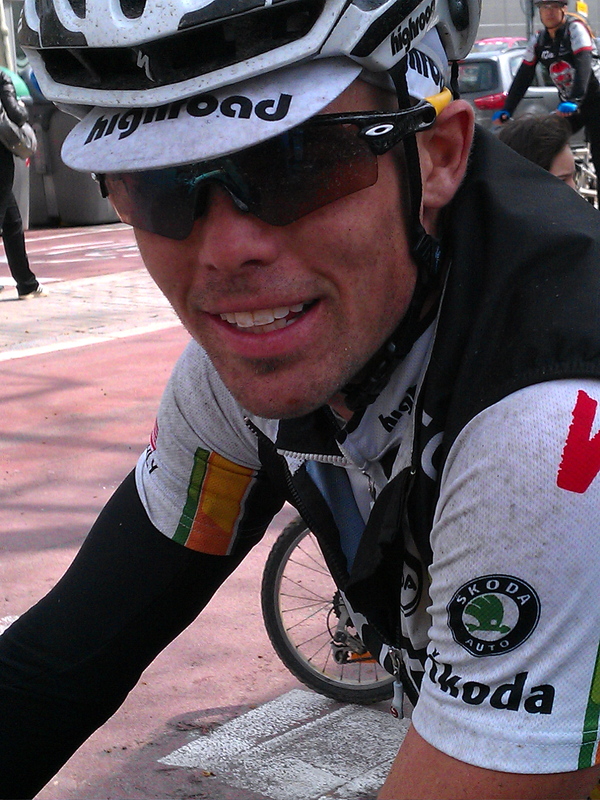 But today bike racing was the goal! I stopped at a cafe to get a bite to eat, thinking I was somewhere near the loop the racers would take and I wouldn’t accidentally miss the race. (Very precise thinking I know, but I haven’t yet mastered the art of finding the perfect location for race viewing.) Somehow, I accidentally placed myself in the middle of the circuit route (which was like a figure eight) and instead of seeing Caleb and the peloton go by a measly four times, I saw them twice each lap! Pretty awesome. I met up with Caleb after the race, and found out he had crashed early on. He was ok, thank goodness. Just a couple spots of road rash and some good bruising. I’m relieved I didn’t see the actual crash, but am bracing myself for the fact that eventually, I probably will. Aside from the crashing, it was a really fun day in Barcelona. I’ve compiled a few more random facts about living in Spain. 1) Going out to lunch is a big deal, and it is very long. It generally involves three courses, wine, cafe con leche, and lasts for hours. Some friends and I spent 3 hours at a cafe the other day, and when we asked for the check our waiter teased for being in a rush! 2) People are aggressive and 3) have a different sense of personal boundaries. When you’re walking down the street, you have to sort of plow into crowds or you’ll never make it anywhere. I realized after awhile that I was sort of hopping around, trying to get out of people’s way and let them by. That does not work. You have to pick a line, and stick to it. At the last minute people will shift over just enough to let you by, and if they don’t, you just have to be braced to take a shoulder. It’s pretty funny sometimes. The older ladies with their carts are the scariest, they’ll bowl you right over. Standing in line is another great example. In the mercadonas everybody stands right up behind you, breathing down your neck and waiting for you to make a mistake and get distracted. Then they’ll swoop past you to the checkout! …That’s a bit of an exaggeration, but they do stand right up against you and look for excuses to cut. Oh and people get INTENSE in the bakeries! After many trips where I waited patiently for someone to help me, I’ve finally learned to step in front, put up my hand, and say “ME! I am next! Right HERE!” The Catalans are serious about their grocery shopping, and I have no idea why in such a chill culture. Maybe they’re all late for a three hour lunch. Last but not least, Lisa (who was a college runner, and who makes it into every blog now because she is awesome) asked me if I wanted to run a 10k yesterday. I’ve been running lately, but not that far! As a side note, I finally realized I just don’t have the discipline to make myself exercise consistently or hard enough, so I asked Caleb to be my personal trainer…haha. Slightly dangerous I know, but it’s been really great. He’s encouraging, and I just needed that extra push to know that there’s an expectation that I will get my workout done while he’s on his ride. Anyway, running in public is nerve wracking for me. But I figured I might as well try it, and lo and behold I actually finished. Not only was it the longest distance I’ve ever run (sad I know, but you gotta start somewhere!) but it was our first “international” race, and my first race anywhere/ever. What a great experience! “The Catalans are serious about their grocery shopping, and I have no idea why in such a chill culture. Maybe they’re all late for a three hour lunch.” I think that is the proper use of irony in an actual literary sense…and totally cracked me up! These are fun, keep writing, you are very good at it. 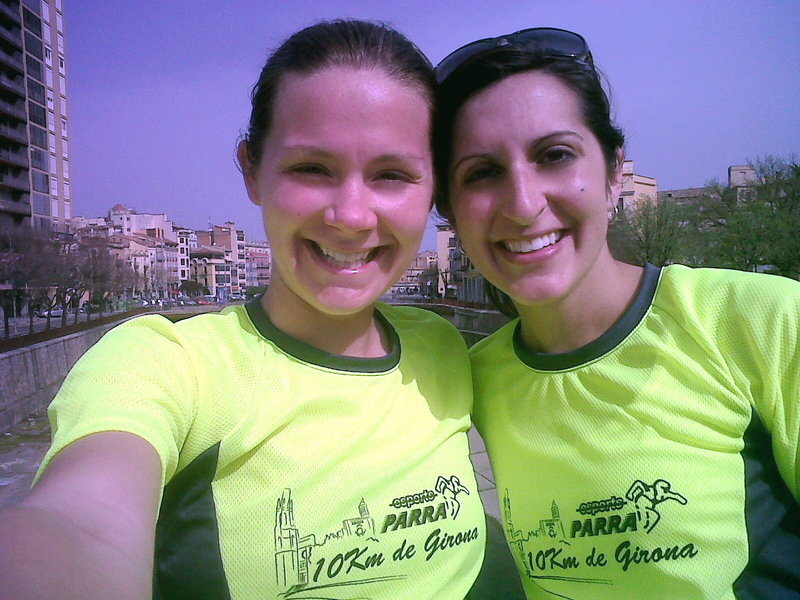 I love that you ran a 10K! Way to go Ally, I am missing you tons.